The Multisizer 3 COULTER COUNTER is the most versatile particle size analyzer available today for a multitude of size range materials. 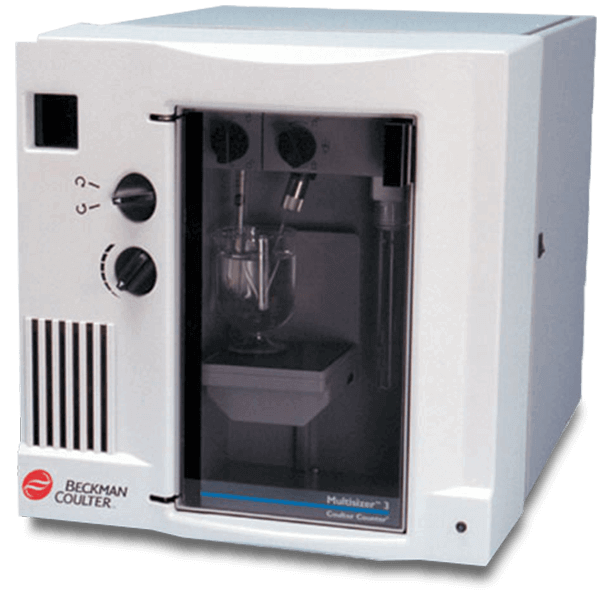 It provides size and volume distributions in number, volume, surface area and mass, with an overall range of 0.4 micro-1200 micro. The Multisizer 3 uses The Coulter Principle (Electrical Sensing Zone Method) to measure particle volume, a direct measurement of a physical property of the particle. While retaining and enhancing the analogs circuits developed and refined by Coulter over many years, the Multisizer 3 incorporates the latest advances in electronics using state-of-the-art digitizing circuits. High-speed digitalization of the signal allows the use of pulse area analysis and other techniques for additional particle characterization. The resulting measurement data can be analyzed and formatted in numerous ways, or stored and re-analyzed at a later date with no need to analyze the sample again. The measurement data for each particle analyzed is stored. The instrument automatically corrects for coincidence. For biological or industrial applications, in quality control or research, the Multisizer 3 you will get the high-resolution and accuracy you demand.